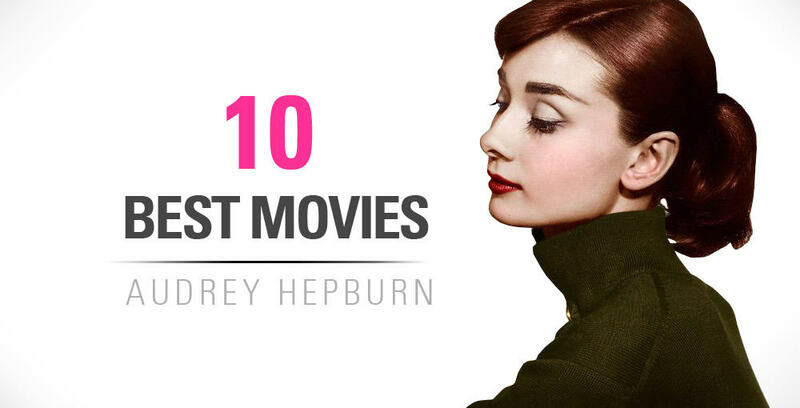 Get ready for the top 5 most glamorous Audrey Hepburn Dresses. Now…everyone has their vices! Be it wine, dating, or a movie with popcorn, there is always that one thing that you can’t resist when it comes to spending time and money. As you can imagine, it becomes more complicated when you’re a celebrity! Graced with more money and less time, finding your vice through the daily hubbub can be a frustrating challenge. After all, everyone needs to cut loose every once in a while, especially after a hard day’s work! While every facet of her style was fashionable, the area where Audrey Hepburn truly shined was in her choice of dresses. It is safe to say that a new dress was Audrey’s true vice! She adored wearing the newest trends and certainly made a point to set a few herself. Nearly every movie Hepburn starred in has an iconic dress to go with it. 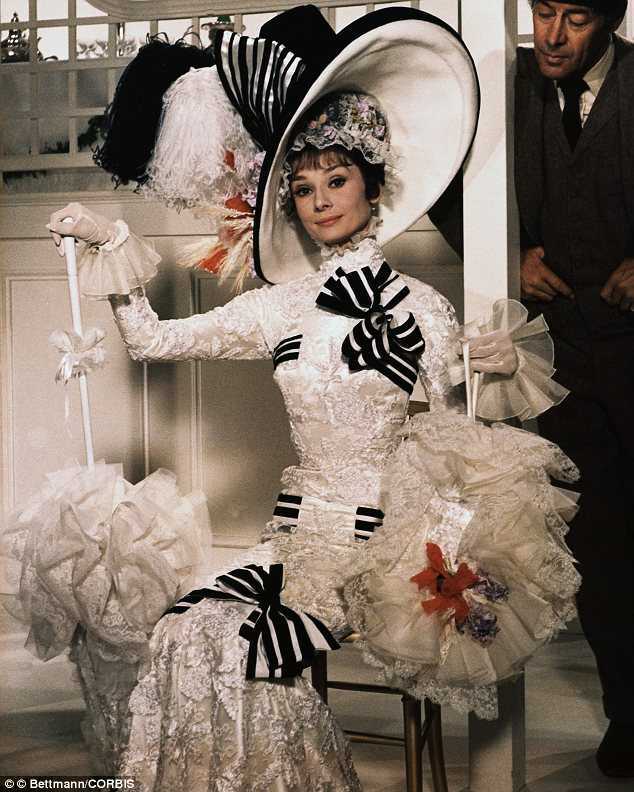 The ostentatious black and white ensemble sported by Eliza Doolittle at the Royal Ascot Races is one of the most unique costumes ever worn by Miss Hepburn onscreen. Renowned English costume designer Cecil Beaton made this extraordinary piece for the actress, who is usually known for his classically cut, timeless silhouettes. Beaton was known for designing in Gigi as well, and is up there with the best of them as a curator of stylish and original designs for film and stage superstars like Audrey. This exquisite ensemble features layers upon layers of lace ruffles, full sleeves, a mermaid silhouette, black and white striped ribbons, and a larger-than-life-hat topped with flowers. Based on looks alone, no one in the film could’ve guessed that Hepburn’s character wasn’t a born-and-bred member of high society while wearing this outfit. The actress Debbie Reynolds, of “Singin’ In the Rain” fame, paid 100,000 to own the outfit, which sold for 3.7 million dollars at an auction of her private collection on June 19th, 2011. This is arguably one of the most famous garments ever designed for a movie, and one of Beaton’s most acclaimed works. His designs for My Fair Lady earned him the Academy Award for Best Costume Design in 1964. Unfortunately, if you want to buy this dress you’ll need to get it designed from scratch. Nicole Kidman had designer L’Wren Scott make a dress inspired by this one, and you can safely assume it cost her a small fortune! In terms of cost, this rivals the Breakfast at Tiffanys dress and makes the My Fair Lady Dress one of the most expensive Audrey Hepburn Dresses! The movie in itself is a testament to fashion and all things couture, and it shows in every beautiful ensemble that Hepburn models in the film. One of the most stunning pieces she wears is this stunning red silk dress and organza shawl, one of the many designed for the actress in her career-long partnership with Hubert de Givenchy. The story behind this and other dresses in Funny Face is interesting enough: Hubert de Givenchy was vouched for by Audrey following Edith Head’s Oscar for the designs in Sabrina, which Givenchy also contributed to but never saw the same credit for. Audrey passionately and fervently defended his prowess and when Funny Face began production she reached out to Givenchy for the most prominent designs. She wears this piece in the modeling montage where she poses, open armed in front of the Winged Victory of Samothrace at the Louvre. As she floats down the stairs surprising her co-star, a photographer played by Fred Astaire, she has finally come into her own as a model, despite her humble beginnings as a bookstore clerk. Unfortunately, this too doesn’t exist in the market for dress-lovers. Your best bet would be to design one yourself, or maybe, drop Givenchy a line! This is one of tne of the boldest colored Audrey Hepburn dresses of the bunch that I’ve seen her wear… or am I wrong and missing a dress? For her second major film with Paramount, Audrey sported this unique film-fashion staple, another Givenchy number. It helped to cement her place as one of the true pioneers of every woman’s closet essential: the little black dress. This cocktail dress features a full skirt that fans out from the slimly tapered waistline and hits just below the knee. The back features a v-cut, and small dainty bows adorning the straps. However, the most memorable aspect of this dress is the unique horizontal, high neckline that perfectly flattered Hepburn’s long neck, flat chest, and broad shoulders. 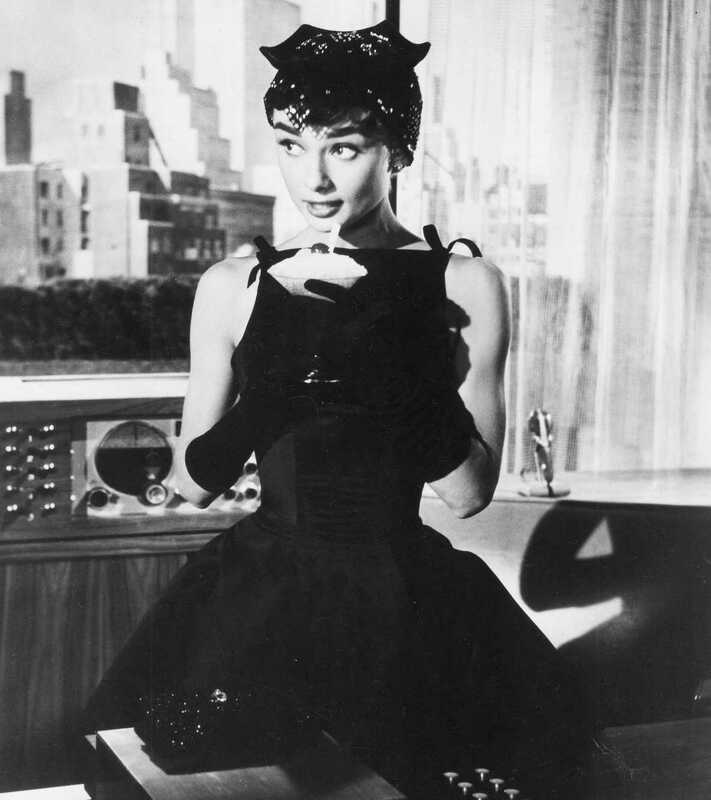 Givenchy finished it with the classic black gloves and pumps, and a cute little black hat that almost made it onto our list of the Top 5 Iconic Audrey Hepburn Hats. I Need this Dress… Where Can I Buy one? Luckily, this dress has been recreated time and time again for Audrey fashion fans. You can find it here at the best price, and here and here for more of a custom / handmade effect. 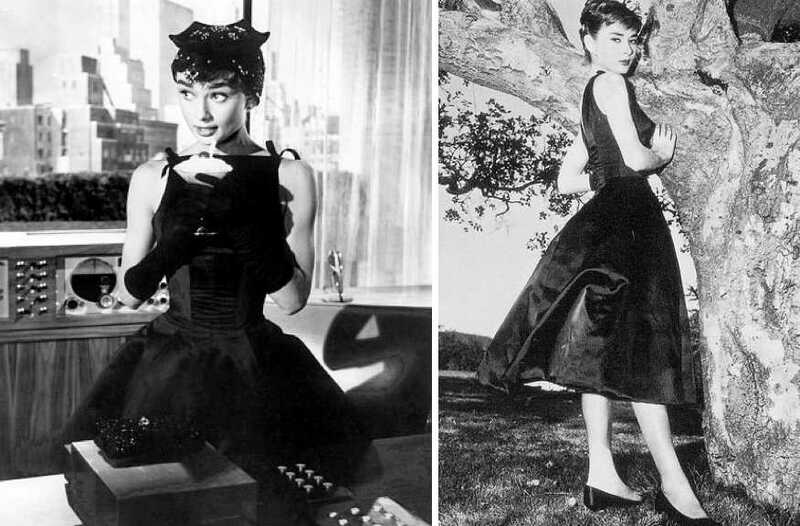 The black Sabrina Dress is one of my favorite Audrey Hepburn Dresses because of the old, vintage 1950’s look. I think it’s a very classy look, with the spin out making it both cute and fun. 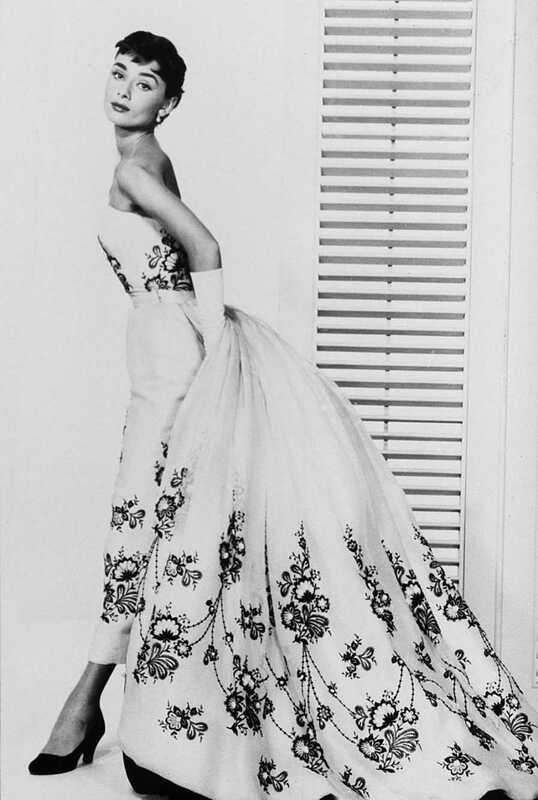 The jaw-dropping, strapless, white satin ball gown with black and gold embroidery worn for Audrey’s role in Sabrina also came courtesy of her partnership with Hubert de Givenchy. This organdy gown also has a detachable court train, lined with black ruffles and showcases beautiful floral embroidery, complete with delicate beadwork throughout. According to Vanity Fair, Dreda Mele, who was both the owner of the Paris Armani boutique and a previous borrower of this dress sample, reminisced about the first time she saw Audrey in the dress, saying “She was something unreal—a fairy tale!” The characters in Sabrina obviously shared this sentiment, as she turned heads as the undisputed belle of the ball for arriving at the Larabee soiree in this regal piece. I HAVE FOUND this very close representation of this dress at a very good price! It’s not exact, but will give you the same design effect. It really is stunning, and no, you probably won’t find the EXACT one anywhere for yourself…but you can find it for your favorite Barbie doll! The Breakfast at Tiffany’s black satin sheath dress is hands down the epitome of Audrey Hepburn’s individual brand of glamour. When you imagine the actress, this is the dress that you think of her wearing. This piece, also masterminded by Givenchy, has become her trademark. Some sources say that the original dress designs were edited by costume designer Edith Head because too much leg was exposed. Regardless, the sleek, polished silhouette of this gown is particularly remarkable, especially on Hepburn’s slender and delicate figure. The half-moon shape of the neckline of the back of this dress gives the perfect frame for the oversized pearls she draped around her neck to accessorize. The character in the dress was the one-and-only Holly Golightly, now the timeless characterization of feminine allure and strength. Without the dress, her impact on audiences across the world, then as well as today, would surely have been different. So… Where can I Find This Dress?! According to Christie’s, the London retailer that auctioned off the dress, the actual dress designed for Hepburn was sold for $923,187 in 2006 to an anonymous telephone bidder. There are a ton of different options out there and spin offs. However, the best one that I’ve found (out of the hundreds that I’ve searched through) that CLOSELY resembles the fit and style is found here at this affordable price. What were YOUR Favorite Audrey Hepburn Dresses? You have a better dress for the list?? Do you think there should be a dress added to this list? Roman Holiday? Maybe Love in the Afternoon? Let me knooooow! Next article30 Best Marilyn Monroe Quotes with Images! I also like the dress from Sabrina wich she wears in the garage. And ofcourse, Audrey makes every dress look beautiful. Are you talking about the one she was wearing in the garage in the beginning of the movie before she “transformed”? Yes, that’s the dress I mean. I have a poster of Audrey wearing that dress.